But who all would fit in one world together? The night he came home. Again. So the Hocus Pocus sequel is now a Disney Channel TV reboot. Sigh. 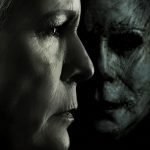 Jamie Lee Curtis returns to the Halloween franchise… yes, four decades later Laurie Strode aims to end her battle with Michael Myers. Wait, didn’t she do that already? Man, Halloween is made for stuff like this! Well, this cold be interesting… would you tune in weekly? Oh, hey! They’re remaking Halloween. Again. God, does anyone even want this?! Halloween Returns is the name. Really. Halloween getting not a reboot, remake or reimagining but rather a… recalibration. Sigh. From the guys behind the last few Saw sequels.